YouTube’s long-awaited and much vaunted Red Subscription Service will finally be launched next week Wednesday, 28 October, the service will become available to iOS users through the standard YouTube app, or alternatively via Mac, or even Apple TV. The new yet to be launched service brings a substantial surprise to Apple fans, to whom it will become available on their iPhones or iPads at the expense of $12.99 per month, while Android devices will be able to field the same service at just $9.99 per month. The significant variation in charges is due to Apple’s policy of taking 30% from any subscription revenues on apps and YouTube decided to pass the buck directly to Apple’s consumers. 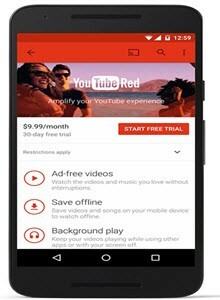 YouTube subscribers within the US borders will be able to try out the new subscription viewing service by benefit of a one-month free trial. The new service is vaunted to be the ultimate experiences by allowing subscribers to view their videos in an advertisement free milieu, where it subscribers will soon be able to download their videos for later viewing without the requirement of a live Internet connection. YouTube’s Gaming app as well as the company’s yet to be launched Music app will enjoy these same advantages. Its Music app was designed with an eye on providing a much more intuitive and user-friendly experience to subscribers wanting to discover new, watch, or listen to music. Subscribers will enjoy one of the richest catalogues available in music worldwide to start them off on their personal musical journey. As with their recommended Video list its Music app will offer a similar recommended list which will become increasingly accurate as it users continue on their journey, as a special surprise YouTube’s Red works in conjunction with Google Play Music so whenever users subscribe to the one they will automatically benefit from free access to the other. YouTube Red subscribing members will at the start of each year benefit from new original movies and shows featuring numerous major Tuber stars that include the likes of CollegeHumour, PweDiePie, as well as a multitude of others.